The Mount of Beatitudes has a strong significance in Christian and Jewish history; many of the faithful believe that it is the location where Jesus delivered the Sermon on the Mount. Located in Tabgha, Israel, The Mount of Beatitudes is quite the tourist attraction on the northwestern shore of the Galilee. 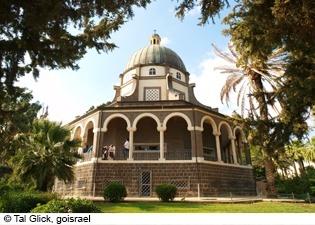 The Mount is approximately 17.5 meters above the Sea of Galilee and from the Mount; visitors can see the eight-sided Church of Mount of Beatitudes. The Church is located on the slope of the mount. According to some sources, the basilica of the church was built sometime between 1936 and 1938, designed by Antonio Barluzzi, a famous Italian church architect. Gardens and a monastery have been erected in the area of the Church of Mount of Beatitudes; visitors can gather in the gardens to contemplate or to listen to sermons or observe other religious rituals. The monastery was completed in 1922 and houses the Franciscan Missionary Sisters of the Immaculate Heart of Mary. There, visitors can attend prayer courses and study. There are plans to expand the housing facility to increase the number of rooms for visitors in the guest house and to create a retreat center. Located along the Jesus Trail in the Holy Land, the Mount is open to visitors from 8 am-11:30am & 2:30pm-4:40pm and admission is 5 shekels per car. If you’re interested in scheduling a vacation to explore the Mount of Beatitudes and the nearby locations, we can help you to create the perfect Christian Israel tour to the Holy Land. 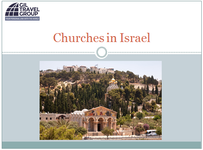 We would like to offer this selection of churches in the Holy Land that are off the beaten trail for you, please click to download.